You might think that the best bikes to aspire to ride are those of the factory stars. Wrong! The best bikes to ride are those owned and built by the factory stars’ mechanics. The mechanics’ personal bikes are almost always better than the factory bikes these top-notch mechanics build for their riders. Why? For the most part, factory mechanics are just ordinary joes who like to ride and race when they aren’t working for their superstar charges. They like silky-smooth suspension and engines that are fast but manageable. Their bikes have little in common with the bikes of the factory riders they work for. Factory riders prefer unbelievably stiff suspension, rocket-ship engines and chassis that handle best when hitting every bump head-on. You may dream of riding one of Ricky Carmichael’s National Championship bikes, but take it from guys who have ridden every one of Ricky’s works bike (from the time he was on a KX85 to the RM-Z450 he took to Loretta Lynn after he retired), you wouldn’t like it. Believe it or not, factory bikes are not the dream machines that mortal men think they are—not even close. RIDER BUT HAD BEEN BOUGHT AND REBUILT BY A FACTORY MECHANIC. powdercoated black. The plastics have an updated look with the R-Tech restyling kit. Ah, but the personal bike of a factory star’s mechanic is often a hidden gem. Why? These mechanics have access to unobtainable parts. They possess the knowhow to put the perfect machine together and the wherewithal to properly set up the bike to the nth degree. With this in mind, the MXA wrecking crew went looking for the double whammy—a bike that was once owned by a factory rider but had been bought and rebuilt by a factory mechanic. You can’t get much better than that. 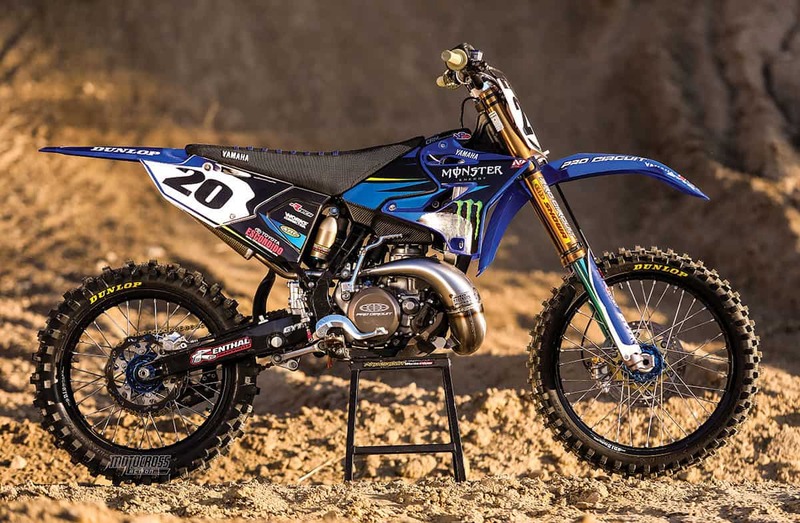 We found our double whammy via Ivan “Hot Sauce” Tedesco and Jon “Throttle” Mitcheff—and the YZ250 that they shared. Jon is a veteran mechanic and has seen it all. He worked for Pro Circuit Kawasaki as a race mechanic from 2002 to 2009. He started off working with Stephane Roncada, got his first championship with Ivan Tedesco in 2004, then moved on to wrench for Ryan Villopoto. Jon was Ryan’s mechanic for RV’s entire 250 career, where the pair won three AMA 250 National Championships and one Supercross title. When Ryan stepped up to the 450 class at Team Kawasaki, he brought Jon with him. Later, Jon became the team manager for the Valli Yamaha team and is now currently back at Pro Circuit. Ivan never got to ride his 2013 YZ250. He had a box of cool aftermarket parts and the best intentions, but Ivan was never able to pull the trigger. So, Jon stepped up and made a handshake deal to take the bike and the box of parts off Ivan’s hands for $3500. When Jon stopped by Ivan’s house to pick up the bike, it was literally in pieces, but for a factory mechanic, that was no big deal because it saved Jon from having to take it down to the frame himself. THE GEAR: Jersey: AXO Motion vented, Pants: AXO Motion vented, Helmet: 6D ATR-1, Goggles: EKS Brand EKS-S, Boots: AXO A2. WHAT WAS IT LIKE TO RIDE? 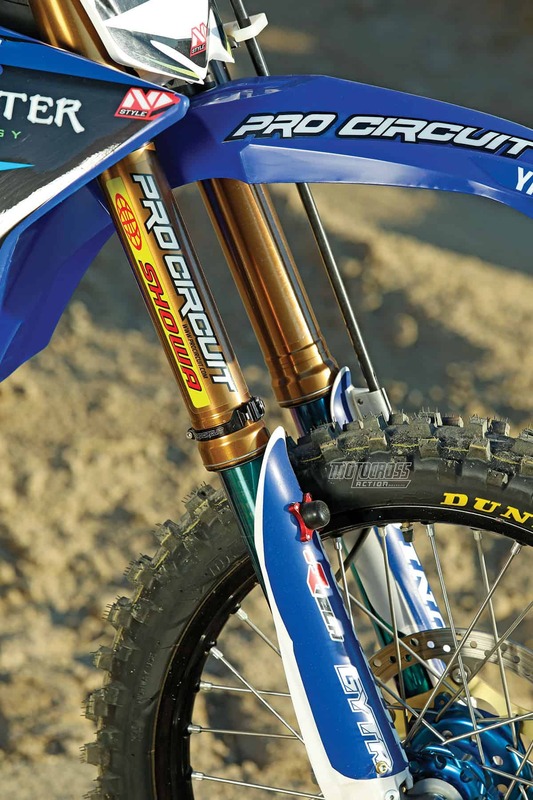 IT WAS EVERYTHING WE WISH A YZ250 COULD BE, WITH THE CAVEAT THAT THE YZ250 HAS THE OLDEST LIVING CHASSIS STILL IN PRODUCTION TODAY. Both the head and cylinder were ported and polished by Mitch Payton himself. The engine was playful yet powerful. 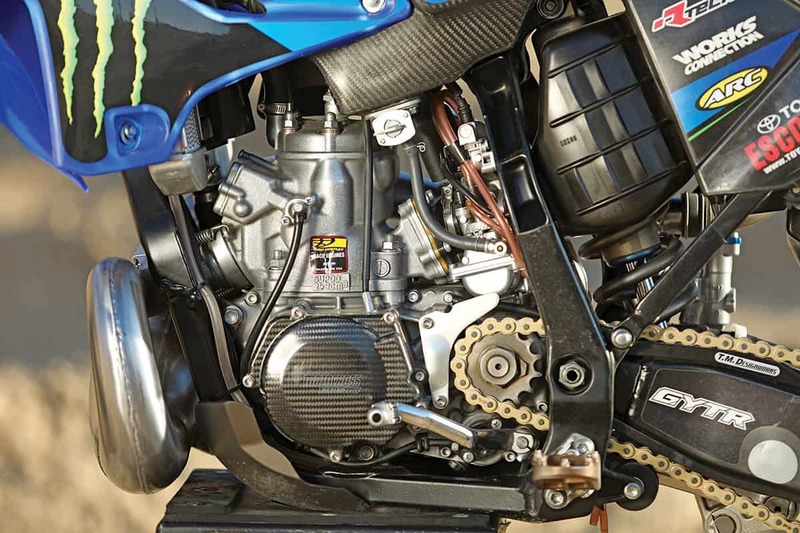 The trickest parts on Jon’s YZ250 build were an Italian-built CRM Composite tank and ignition cover. The rest of the build included Duyba-built wheels, updated R-Tech plastic, a Works Connection perch mated to a handmade ARC lever, Renthal bars, Kite triple clamps, a Pro Circuit pipe, EBC 280mm oversize front rotor and a Pro Circuit clutch cover—and much more. What was it like to ride? It was everything we wish a YZ250 could be, with the caveat that the Yamaha YZ250 has the oldest living chassis still in production today. Since the chassis was designed back in 2006, the handling is not as sharp as what’s available on the newer smokers on the track. It was not bad by any means; however, band-aid fixes had to be used to stop the bike from shaking at speed without sacrificing turn-in. The Factory Showa forks and Mitch’s magic hands on the cylinder and head distracted us from the aspects of the YZ250 that felt old-school. 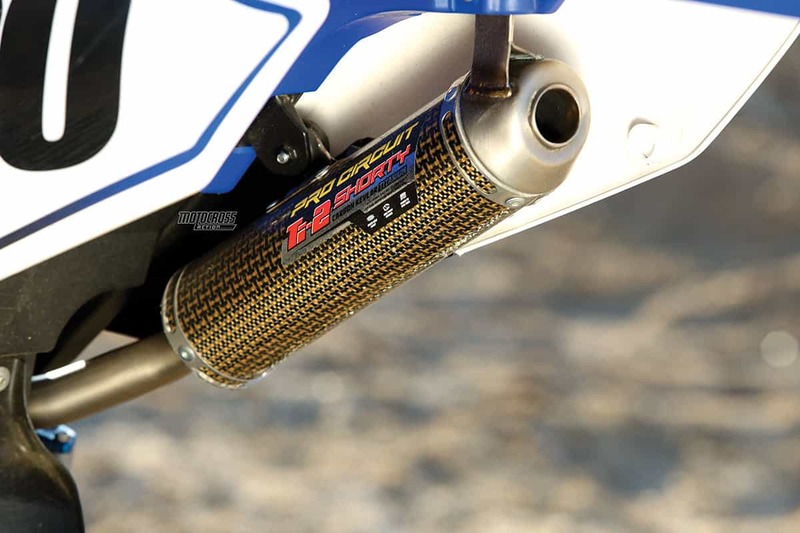 This is a one-off Pro Circuit titanium/carbon fiber silencer that Chad Reed ran on his 2005 factory Yamaha YZ250. MXA test riders believe the stock Kayaba SSS forks are the highest standard, but as good as they are, they can’t hold a candle to Jon Mitcheff’s scavenged Showa factory forks. 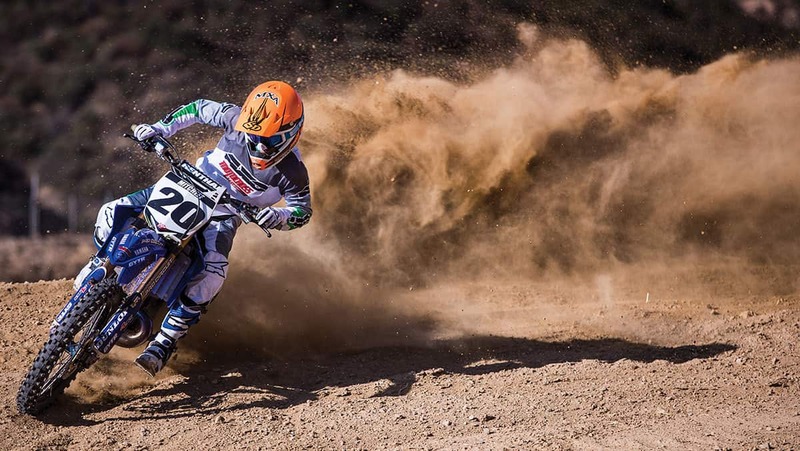 In the rough chop, it felt like the MXA test riders were riding on clouds. The forks were super supple yet held up on harsh hits. Now you might think that the metallurgy, close tolerances and fancy coatings on the works forks were what made them feel so good—not so. Forks are only as good as their valving, and works forks with bad valving aren’t any better than stock forks with bad valving. Luckily, Bones Bacon worked with Jon to make the Showa forks and Kayaba shock perfectly balanced. Jon is still in the process of locating a one-off factory Showa shock to match the forks. Until then, we loved the sweet sensation of his mixed suspension components. ON IT AND GOING “VROOM.” THIS BIKE IS LITERALLY PRICELESS. 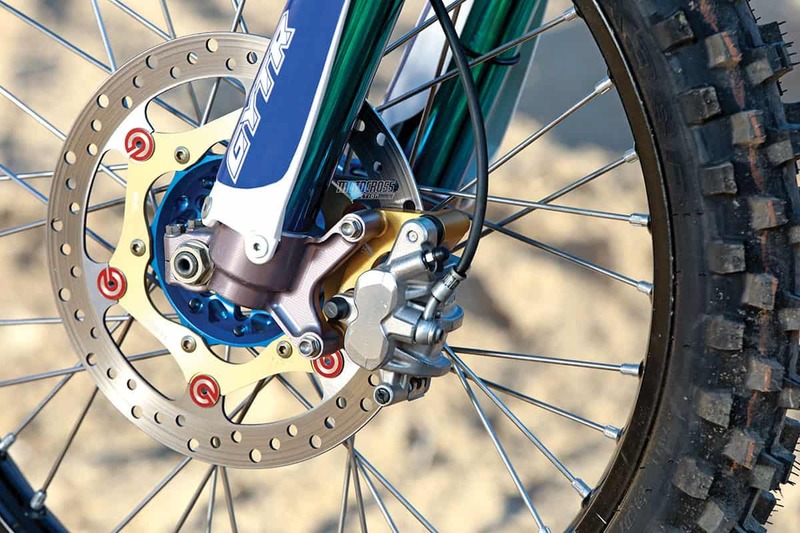 The 2013 YZ250 has poor braking components compared to today’s Brembo standards. A 280mm EBC oversize front rotor was used to bump up pucker power. 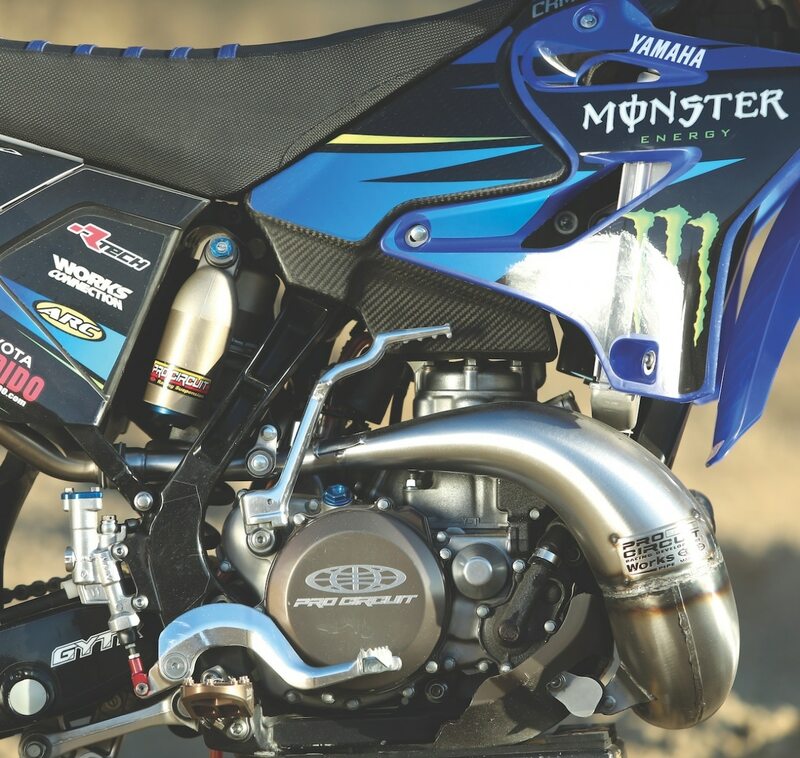 Mitch crafted the YZ250 engine so that it would be manageable for mere mortals. Jon could have had Mitch build him a 2005 Chad Reed replica engine, but Jon was smart enough not to ask for it. 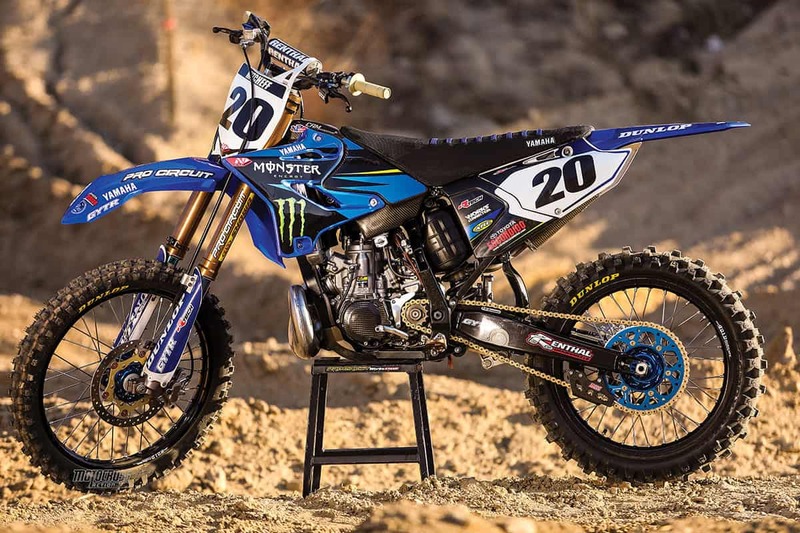 Good thing, too, because MXA tested Chad Reed’s 2005 Factory YZ250 back in the day. It was a light switch. It was temperamental, hard-hitting and too much for anyone of lesser talent than Skippy. Jon’s engine was nothing like Chad’s, even though Jon had the silencer. It ran with the same curve as the stock powerband but with the dips filled in and the power raised significantly throughout the entire rpm range. It even had improved over-rev. The power had flair that made the bike fun to ride. 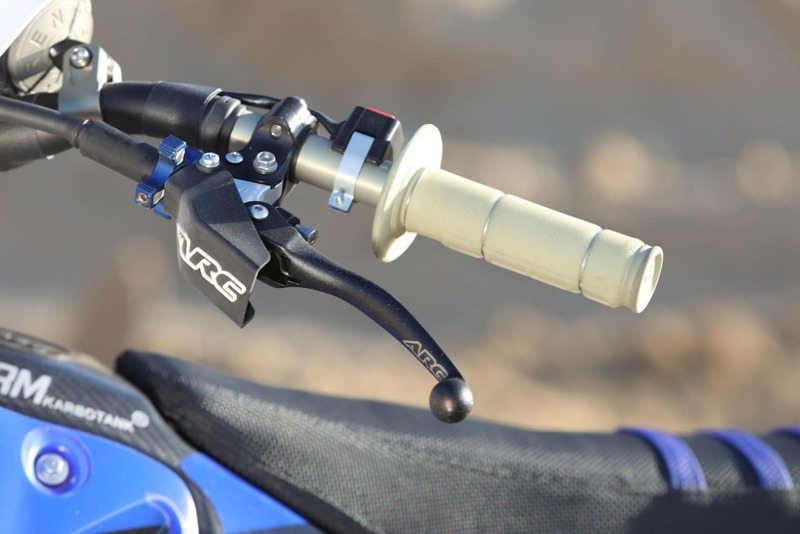 Our testers felt the Pro Circuit-built engine would easily run with, or outpower, a new-age KTM 250SX. Loved it. Loved riding it. Loved looking at it. Loved sitting on it and going “vroom.” This bike is literally priceless. You would empty your bank account locating and buying these factory parts off the dark web; however, most of the upgrades are simple, blue-collar improvements. This build, without its one-off trickery, would still be a sweet machine. Two-strokes are the working man’s machine, and this one just had a sweet tooth for titanium and carbon fiber. Bones Bacon revalved the factory Showa forks to work with the Kayaba SSS shock. The balance was fantastic.